It's hard to believe this little guy is going to one day be a big lion with a beautiful mane and all! Right now, he's just a cute little kitten mewing roaring away. Other videos from this person say this this little guy's twin died, and that they separate them from their mother to hand-raise before they are old enough, and then they are reintroduced to the pride. From the sounds of the people oooohing and coooing over him, it sounds like he's getting lots of love! P.P.S. Happy New Year, everyone! I hope you have a happy, healthy, cute year to come! Give all your kitties and doggies and bunnies and birdies and ferrets (everyone!) a huge smooch at midnight from me! And smooches to you all, too! 2011 has been fun... now let's make 2012 the CUTEST YEAR EVER! With a belly full of kitty milk, Ohagi the sweet little kitten is cuddled up for a nice, relaxing cat nap. I wonder who he's talking to in his dreams... a squirrel? Another kitten? His mommy? Their other videos say they found this precious bundle all alone and without his mom. They rescued him and kept him safe and sound until he grew big and strong. Here he is all big and strong and happy in his home! When I saw the first Lil' Drac baby bat video, I immediately fell in love, and I think a lot of you did, too. Yesterday they put out a new, updated video of our little bat buddy -- he's all grown up, and just as cute! Now he can fly all on his own and eat solid food... and he still loves to rock, which melts my heart. His story is so touching and beautiful to me. What an amazing place and amazing people at Bat World Sanctuary to give such loving care to such little creatures! P.S. At the end of the video, they say you can buy a wristband to benefit Bat World Sanctuary... I am going to buy one for one of you! Kind of like a giveaway, but I'm buying, because it's such a great cause and I'm in love with what they do. I'll announce the winner tomorrow and order it right away so they can help more baby bats! P.P.S. 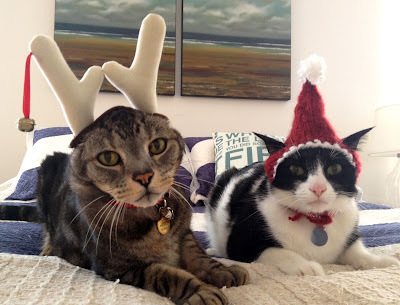 Pimp and Moo thought this was cute enough to stand in for them on Two Cats Tuesday today (and they're pooped from all the holiday festivities). They'll be back next Tuesday! When it's cold outside, it's important to grab your favorite blankie and bundle up into a burrito to stay warm. Sometimes it might take a little work to get your favorite blankie into bed and wrapped around you, but it's all worth it in the end when you're nice and toasty! We got your festive right here.